First, click on "Assets & RMM" on your navigation bar to find your Asset list. It will look something like this once you have a few assets. Here, you can create new assets, sort/filter/search your assets, edit multiple assets at once, and so much more! Syncro has two different asset types. We call them Syncro Devices and User Created Devices. - Fully customize-able with custom fields. - Default "Computer" asset type included and editable. - Used for Syncro Agents, and created automatically once you install the Agent on a device. If you click on the name of an asset, it will open up the asset details. This will display more information for the asset, like the customer, custom fields, and tickets associated with the asset. You can also create a new ticket for the asset/customer, or edit/delete the asset. The asset list also comes with an advanced search. You can filter by customer and asset type, and also save those filters. You can save and choose a more advanced search by clicking "Filter." Selecting "Create New" will let you create a brand new filter with more advanced search terms. Syncro assets have a modal that allow you to quickly interact with an asset without having to open up the asset details! This modal will allow you to run a script, change the policy, open Syncro Live, and display pertinent information for the device. Furthermore, this modal is available on Customer and Ticket pages, so whenever you see those icons, click them to pull up the modal! The asset list also has access to policies and scripts for you to create and edit. You can learn more about policies by clicking here and more about scripting by clicking here. By checking off multiple assets, you will unlock the manage drop down. This will allow you to modify multiple devices at once, like printing labels, changing customers and policies, and deleting assets. 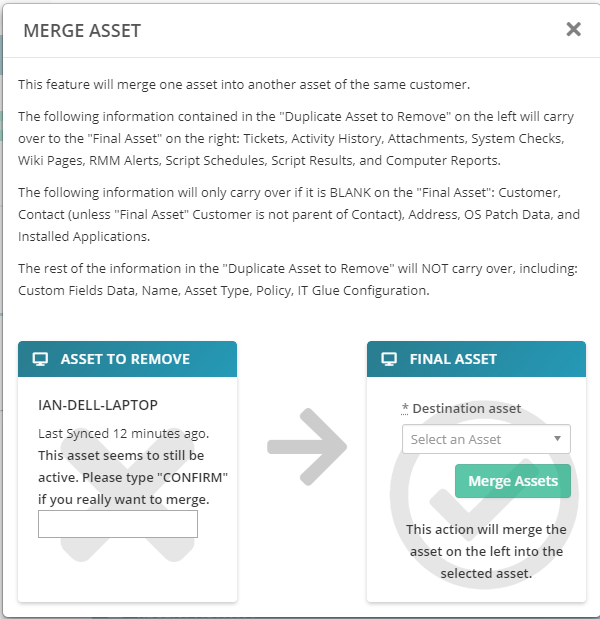 To Merge a Asset/Device, click in to the Device Detail page, click Actions, Merge. Next a pop up will appear where you can select the Asset that you would like to merge to. Click Merge and you are done.